Vacuum cleaners…most of us think of the electric-powered devices that we clean our carpets at home with. The idea of utilizing vacuum in cleaning applications, however, predates the widespread introduction of electric power by a couple of decades. The original idea was to marry a manual vacuum generating device to a carpet sweeper. These had been around for some time, and they’re still seen today: the beater brush turns as the sweeper is pushed across the floor; it picks up dirt in the brush bristles, and deposits it in an internal receptacle. You’ve probably seen them used in restaurants to tidy up small messes on the floor, in lieu of dragging out the noisy vacuum cleaner while folks are eating. Anyway, these first vacuum cleaners relied on a bellows, piston cylinder, or other such device that was operated by hand, foot – or, according to one source, a rocking chair – to generate a vacuum. Since it took one person to operate the vacuum generating part, and another to push the sweeper, they weren’t very popular at a time when folks were generally looking for labor SAVING products. The proliferation of electric power around the turn of the 19th/20th century brought about electric vacuum cleaners. Most homes have one…including the ‘shop vac’ in my garage, my home actually has three. These are great for home use; many have long cords that allow you to clean the floors in adjacent rooms without unplugging & re-plugging, and most come with a convenient set of tools for baseboards, furniture, HVAC vents, etc. For carpet & upholstery, they can’t be beat. In industrial settings, though, the electric-powered models can find themselves at a disadvantage. The impellers can clog or break, and the electric motors will, in time, burn out. If used in wet environments, great care must be used (as with any electric products) or there can be a very real shock hazard. EXAIR Industrial Housekeeping Products offer a solution to all of these issues. With no moving parts or electric motors, they are extremely reliable. If you supply them with clean air, they can run darn near indefinitely, maintenance free. And no electric power means no shock hazard. We have a variety of products to meet most any need. Our Chip Vacs and Heavy Duty Dry Vacs are made for dry material cleanup. They install (in minutes) on an open top drum, and are available with a variety of accessories…tools, drum dollies, tool holders…even the drum itself if you need one. The Chip Vac is specified for most ‘general purpose’ jobs; the Heavy Duty Dry Vac is more powerful, and abrasion resistant, for more aggressive needs. Both exhaust the vacuum air flow through a Filter Bag to contain the particulate in the drum. 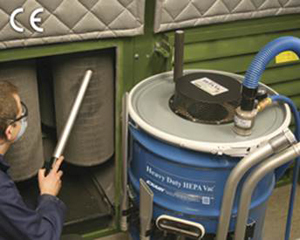 The Heavy Duty HEPA Vac features the same high power and rugged construction as the Heavy Duty Dry Vac, but replaces the Filter Bag with a HEPA (High Efficiency Particulate Air) Filter for maximum dust containment. These are used where critical dust removal, mold & allergen containment, or trapping airborne irritants are called for. The Reversible Drum Vac is a two-way liquid pumping system, also made for mounting on standard steel drums…closed top drums, in this case. They can fill or empty a 55 gallon drum in 90 seconds. Options include 5, 30, and 110 gallon drum sizes, and a High Lift model – increased suction head for deep wells, underground tanks, or higher viscosity liquids, up to 1,400 cP. Chip Trapper Systems come complete, ready to go, right out of the box. The Reversible Drum Vac is also at the heart of our popular and award-winning coolant filtration system: the EXAIR Chip Trapper. A Filter Bag in the “fill” line traps chips, swarf, and shavings. The liquid passes through, and is able to be immediately pumped back out. Not only is coolant life extended, regular cleaning of the coolant sump prevents loss of coolant flow due to clogging of the supply lines. The Chip Trapper is available in 30, 55, and 110 gallon sizes, and also in the High Lift version. EXAIR’s Vac-u-Gun transforms in seconds from powerful vacuum to efficient blow gun. The Vac-u-Gun is an efficient, quiet, and versatile tool with numerous applications, from vacuuming sawdust or shavings, to conveying small parts or pellets, to blowing off chips, water, coolant, or scrap. And, just in time for Spring Cleaning season, we’re letting you find out just how handy it is, for free – by including one with any qualifying Industrial Vacuum purchase, now through April 30, 2019. If you’d like to discuss a cleanup application, and how an EXAIR Industrial Housekeeping Product can suit your needs, give me a call. Lately, we have been receiving calls from customers that are looking for a wet/dry vac that they are accustomed to seeing in the form of an electrical vacuum for their home work shop. They call us wanting a general clean up vacuum for their shop. The items they are looking to clean up are coolant, dust and chips. Our solution for this is to run two vacuums, and most people are asking why can’t it do both. The answer – cost. Generally, people seeking EXAIR’s pneumatic vacuums already see the value in the durability of a vacuum with no moving parts to maintain or replace when comparing to electric vacuums. It is the simplest of dollar savings, the longer the product lasts and is maintenance free, the more money you will save from the absence of repair parts or new vacuums. And electric vacuums are notorious for burning up motors and not lasting within tough industrial environments. You can read about additional features/benefits within EXAIR’s pneumatic vacuum line here and here, but I will talk about our products specifications in detail. EXAIR has two categories of vacuum, wet vacs and dry vacs. The original wet vac for vacuuming coolant, swarf, or oil is the Reversible Drum Vac (RDV), used to easily empty and fill coolant sumps quickly. The Chip Trapper features a filtration system which removes chips and debris that is within the coolant, keeping the coolant clean, extending the coolant life and minimizing surfaces for bacteria to grow. 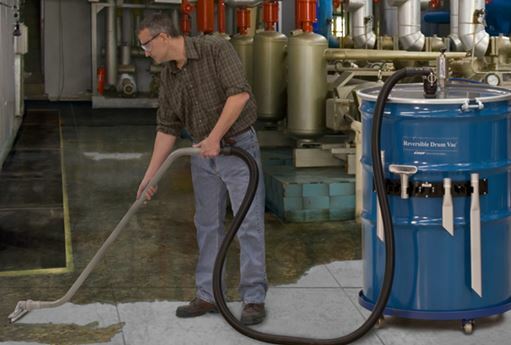 The Reversible Drum Vac and the Chip Trapper Systems use 19 SCFM of compressed air at 80 PSIG of and can fill a drum with 55 gallons of water in 90 seconds. These workhorse vacuums will last many years and withstand the rugged treatment found in hardworking manufacturing facilities. In the other category of our industrial vacuums are the “dry” vacuums. This term “dry” is a little ambiguous, because the vacuums will be able to move some liquid. For instance, the liquid coating a chip or spills on the shop floor can easily be picked up with the dry vacuums. We have a number of dry vacuums available: The Chip Vac is a continuous duty vacuum used for general cleanup around machinery. The Chip Vac drum lid assembly can be used from drum to drum to aid in separating and recycling materials. 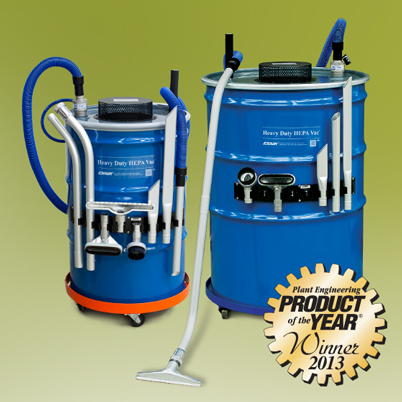 Our Heavy Duty Dry Vac is best for applications vacuuming heavy materials, abrasive medias or longer distance (20′). And the Heavy Duty HEPA Vac is designed to provide protection from airborne particulate and is suited for dusty environments. To compare EXAIR products with other pneumatic vacuums, let’s look at the Chip Vac (40 SCFM at 80 PSIG) and the RDV above (19 SCFM at 80 PSIG). Combining the two vacuums you would require (59 SCFM at 80 PSIG. If you search long enough, you could find a pneumatic vacuum that is advertised as wet/dry, but this ability comes at a cost. The most obvious cost is the upfront purchase price, which is consistently much higher than the combined cost of the (2) EXAIR units. Also the units range in air use from 68 SCFM to 110 SCFM. That is up to 86% more air required! Let’s assume that you did run both constantly. The wet/dry vac will cost you $0.14 extra an hour to run, assuming that your compressed air cost is $0.25 per 1,000 SCF. That is really an unfair comparison to our products though, because we could have (2) vacuums operating at different locations in the plant accomplishing twice as much work. Even still the (2) EXAIR units will save $810 per year with 250 working days in a year and 24 working hours in a day. $810 per year may not sound like to much to you. What if we change the scenario? How much air can you save? Let’s say you run a large wet/dry vacuum, which consumes 110 SCFM, everyday for 8 hours over 250 working days. The wet/dry vacuum will use 52,800 SCF per day or 13,200,000 SCF per year. This compress air will cost you $3,300 just to compress that air. By comparison, the Chip Vac will only cost you $1,200 per year to run in compressed air. Using the Chip Vac instead of the wet/dry vac, will save you $2,100 per year. in compressed air operating costs. In this short story, our customer operates multiple water jet cutting machines. They have slurry buckets stationed at each machine. When the slurry bucket becomes full, they want to empty the bucket and dispose of the slurry. The customer wanted to use the model 6198 Chip Trapper to perform the function of filtering the Boron Carbide from the water component of the slurry. 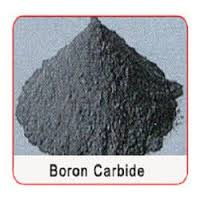 Boron Carbide is a very hard material used for making armor plating for everything from bullet proof vests to tank armor. Being such a hard material, the abrasive factor is really high. They were concerned about the abrasive nature of the material and contacted me to check and see if this material would present a problem for our system. Turns out that the Chip Trapper will operate just fine without any degrading of performance. The reason is that there are no moving parts that could be worn by the abrasive material moving through. In fact, the abrasive material never comes into contact with the pump of the Chip Trapper. The slurry is directed straight into a 5 micron filtering bag where the solids are pulled out. The remaining water is pumped out of the Chip Trapper into a water treatment system for proper disposal. The customer did have a few questions regarding what was included with model 6198 Chip Trapper. The answer is basically, everything you would need to get the unit assembled and operational is included with the Chip Vac. The only input required from the customer is the compressed air utility which is in reasonable supply for this customer’s facility. The customer placed their order with me directly and asked for a tracking number which was sent followed by the invoice which he needed to expense his credit card purchase. If you have an application where you need to vacuum up an abrasive solid that is mixed in with water or some other non-flammable fluid, give the Chip Trapper consideration. You will be glad you did.